One contact lenses solution used by most people is a cleaning solution, which cleans any dirt, debris, and tissue off of the lenses. A disinfecting solution is usually used for gas permeable contact lenses and other types intended for long term use. This product kills any bacteria or pathogens which could cause an infection. It is possible to buy a multi-purpose solution which both cleans and disinfects in one step, for convenience. 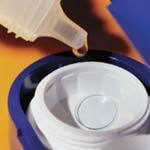 Other types of a contact lenses solution include a peroxide solution, an enzyme cleaner, and a protein remover. Cheap contact lenses intended to be disposable and that are intended for single day use will normally not require these solutions, but long term lenses may need some or all of these products to prevent any problems or complications. If you have any questions your eye doctor can usually give you the answers you need. Colored contact lenses may require special care or specific solutions, so that the color is not affected and does not fade. One type of contact lenses solution called re-wetting solution is only used for comfort. Wearing contacts can cause dry eyes, which can cause discomfort and interfere with vision at times. This solution is used to moisten up your contact lens so it is more comfortable. Rinsing solution is a product which does not disinfect or clean but simply rinses of the lens before you place it in your eye.